Easy to use and stylish too, the PowerShot ELPH 160 camera is designed for hassle-free capture of family fun and special memories. Slim and light, it boasts a big 8x Optical Zoom so you can get close to your subjects quickly. Image quality is sharp and detailed thanks to the high-resolution 20.0 Megapixel* sensor plus DIGIC 4+ Image Processor. When you're ready to shoot impressive 720p HD video, simply press the dedicated movie button. And when you shoot in Smart AUTO mode, the camera automatically chooses the proper camera settings by analyzing the scene based on several common and more unique predefined shooting situations, so achieving the best possible image quality can be effortless. 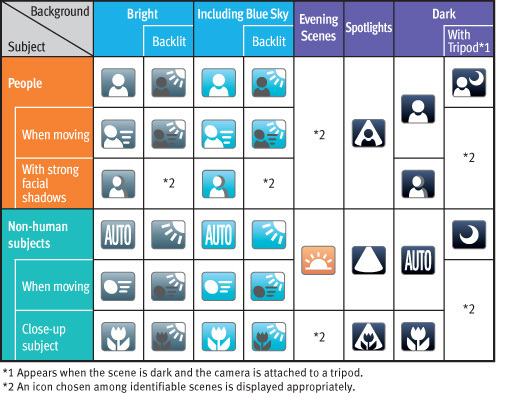 There is even a Help button that provides clear explanations and guidance for camera operations. Preserve your memories beautifully - and simply - with the PowerShot ELPH 160 camera. Spectacular Lens Power for Stunning Images. The PowerShot ELPH 160 camera features an 8x Optical Zoom so more shots are within your reach. You'll love the flexibility that the wide 28-224mm (35mm equivalent) shooting range offers. Plus, the Wide-Angle lens captures expansive image in every shot, adding depth, perspective and grandeur. Landscapes, city scenes, family shots and more benefit from the extra width. Whether you're shooting wide group shots or zooming to the telephoto end, your images are assured to be bright and clear. The PowerShot ELPH 160 camera's DIGIC 4+ Image Processor features accelerated processing speed to create fast, responsive performance, giving you a shooting experience that's easy and natural. The DIGIC 4+ Image Processor also enhances image quality in several ways. Processing of high ISO shots has been shortened by 60% compared to the DIGIC 4 Image Processor. This significantly reduces noise for brilliant color, smooth gradations, and beautiful detail even in low light. The processor's highly efficient design also extends battery life. The PowerShot ELPH 160 camera provides shooting modes that easily give your shots a distinctly artistic feel without the need for any extra lenses and filters. You can make a quirky portrait using the Fisheye Effect or add a beautiful single-tone effect with Monochrome. Toy Camera Effect simulates a vintage look as if capturing the photo using a "toy" or pinhole camera. Live View Control - Enables Brightness, Color, and Tone adjustments to your images using easy- to-understand controls. Face Self-timer - The camera waits for a face to enter the frame before releasing the shutter. Low Light - For high quality image capture in an amazing range of dimly lit situations. Fisheye Effect - Now you can get the fisheye effect - a classic photographic distortion - without a fisheye lens. * Calculated with approx. 6.6MB for each photo and with average 32Mbps Full HD video.